JMC Hairwear & Wig Salon is located in Pompano Beach, Florida, just north of Fort Lauderdale. Listed below are salon hours, driving directions and printable maps to our location. If you need further assistance or would like to make an appointment, please call us at (954) 975-5760. Although walk-ins are welcome, we recommend making an appointment so that you do not have to wait. Please allow approximately 90 minutes for the selection, fitting and styling process. If you decide to visit us without an appointment, our salon is less busy before 11:30 AM and after 3:30 PM. Take I-95 to the Sample Road exit, and head west for approximately 2 miles. 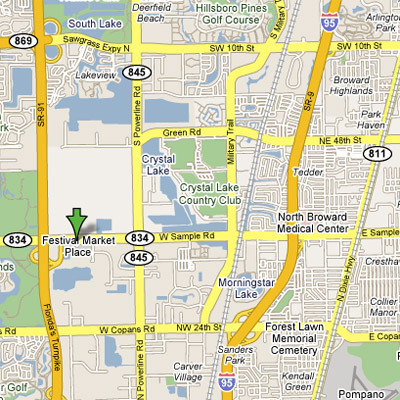 The Festival Marketplace is on the south side of the road, just before Florida’s Turnpike. Facing the building from Sample Road, enter through the second set of doors from the right. JMC Hairwear & Wig Salon is just inside, located between Jamboree and Bourbon Streets, Store #2301. Take the Florida Turnpike to the Sample Road exit and head east. The Festival Marketplace will be on your right. Facing the building from Sample Road, enter through the second set of doors from the right. JMC Hairwear & Wig Salon is just inside, located between Jamboree and Bourbon Streets, Store #2301. Click on the map to get door to door directions from your location. Click on the map for a larger printable version.